CPU: Pentium 3 or Athlon equivalent. RAM: 256 MB RAM required for Windows 2000 or XP. Become part of an Army Ranger team as you battle your way through enemy-infested towns, regain control of the Atlantic, and establish a beachhead as part of the D-Day invasion force on Omaha Beach in Medal of Honor: Allied Assault. Medal of Honor: Allied Assault - Spearhead chronicles the last year of the war on the European front. Parachute behind enemy lines during Operation Overlord, halt the German offensive during the Battle of the Bulge, and engage the German forces as they desperately try to defend the heart of the Reich, Berlin. 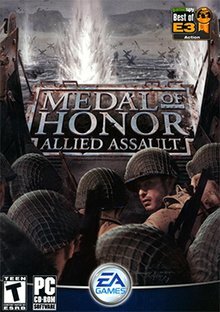 In Medal of Honor: Allied Assault - Breakthrough, you’ll join U.S. Army Sergeant John Baker as fights in the battle at Kasserine Pass in North Africa, race to capture Messina in Sicily, and finally repel the German army at the historic battle of Monte Battaglia in the heart of Italy. Copyrights © 2016 - 2019 | 41,434,325 Served Downloads | 512 Online Now | Contact Us | DMCA | Homs - Syria | WorldSrc Staying & Extending !